On Thursday night Dr. Smith wanted to show the Scholars they could find Socrates in more places than dusty books and ancient Greece. By examining some of the world’s most popular superheroes, from the X-Men to the Man of Steel, he proved that Philosophy is not only relevant, but can also be a whole lot of fun. But what is Philosophy? For a brief recap of the discipline’s 2000 year history, Dr. Smith began with an English lesson. He polled the Scholars to see if anyone could parse out the meaning of “Philosophy”s root words: “philo” and “sophia.” A hand shot up and a confident voice answered that “philo” means “love.” With one correct answer down, Dr. Smith continued to explain that “sophia” means knowledge or wisdom, thus the study of Philosophy is, in its simplest form, the love of wisdom. Then it was into the time vortex and back to the fifth century B.C. where Dr. Smith gave a short profile on one of history’s greatest philosophical figures and “gadflies,” Socrates. He explained that beyond being a great mind, Socrates was in fact sort of a public nuisance. Driven by a love of knowledge, his self-proclaimed purpose in life was to make people question what they thought already knew in order to “instill a sense of wonder or wisdom.” But in a modern world far removed from togas and symposia, how does Socrates matter? 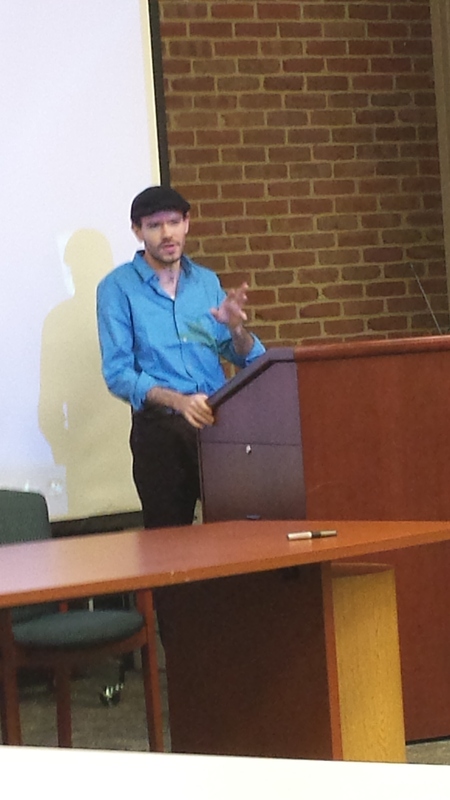 Last week’s seminar was held on the 52nd anniversary of Dr. Martin Luther King Jr.’s “Letter from a Birmingham Jail.” In tribute, Dr. Smith read the letter where King actually identifies himself as a “gadfly” and advocates for the Socratic civil disobedience he hoped would prod the public into social change. With this context in mind, Dr. Smith let the capes fly, making his superhero connection by profiling two major X-men foils: Professor Charles Xavier and Magneto. Both Xavier and Magneto want the same goal for their mutant race, peaceful coexistence with humans, but, as Dr. Smith explained to those not familiar with the comic, these two characters choose completely opposing methods. Xavier, Smith explained, holds a familiar “dream” of non-violent revolution. He asserts that the violence against mutants is a result of hate, a hate which is driven by fear of the unknown. Magneto on the other hand advocates self-defense. He stands against the cruelty that humans are capable of by active prevention. Dr. Smith then asked the scholars a poignant question: who’s the bad guy? But as the Scholars observed, the bad guy in the X-Men isn’t clearly drawn. Pulling the the students’ attention back to the context he mentioned earlier with Dr. King’s letter, he explained that the X-Men were brought to life in the turmoil of the civil rights movement. The comic’s historical background reveals that Dr. Xavier and Magneto, the gadflies for the mutant race, were based explicitly on Dr. Martin Luther King Jr. and Malcolm X. Their differing approaches to the civil rights movement made them not only perfect narrative foils, but made the comic book the perfect medium to present civil rights issues to youth. From the X-Men to Superman, Dr. Smith continued to expand on just how many iconic comic book moments have been fueled by ancient philosophical principles. Even DC couldn’t resist a nod to Krypton’s origins in Greek philosophy, Dr. Smith reveled as he noted a scene from the recent Man of Steel film where Clark Kent can be seen clinging to Plato’s Republic. Additionally, Dr. Smith pointed out that The Green Lantern steals his power straight from Rene Descartes, and Spider Man’s famous quips about “great responsibility” are lifted directly from Voltaire. 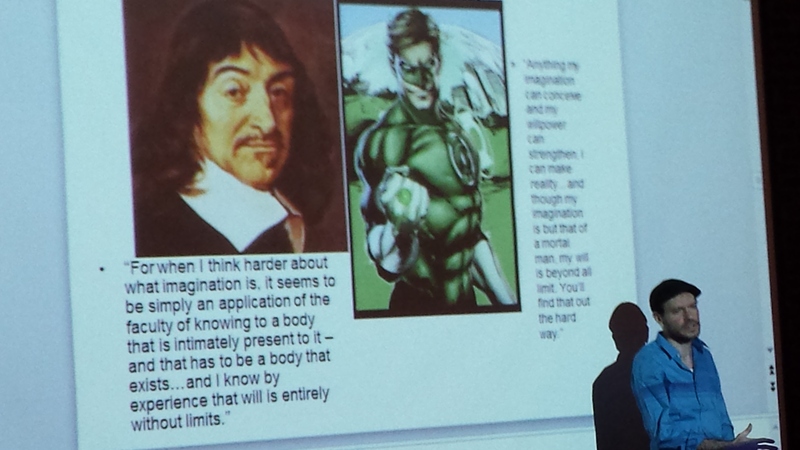 Dr. Smith shows how many issues of human existence dealt with in comics come out of philosophy–in this case, Descartes’s influence on the creation of the Green Lantern. Last Thursday night, Dr. Smith wanted to show the Scholars that Philosophy’s influences reach far beyond academic borders. In his own words the whole purpose of Philosophy is to “help you do whatever you love better.” For Dr. Smith it’s taking Philosophy into the midst of public passion. “Pop culture is important to people,” he concluded, which therefore makes it important to study. But wherever there is learning and understanding, questioning or digging deeper, that is exactly where Philosophy lives–even behind the mask of a favorite hero. 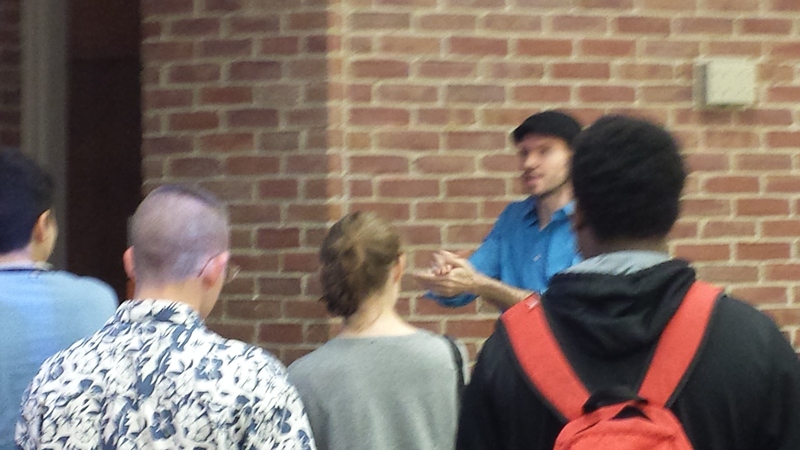 Scholars asking a lot of questions and talking with Dr. Smith about the philosophy of popular culture after his presentation.